Lord Krishna is described in several forms. 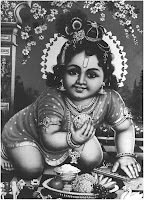 This one is Bala Krishna ( the young one) with butter in His hands. The story is that he steals the butter. Critics of idol worship say “Why are you worshipping a thief?” Here is why. What does the butter symbolize? Butter is made out of buttermilk by churning it. We make butter from the buttermilk by our efforts. Similarly, in order to attain Absolute and Divine Knowledge human effort is needed. Butter is the essence, the cream of knowledge of the person who worked hard for it. Krishna says: “If you put the needed effort to evolve to Higher knowledge, you do not have to come searching for me. I will come and take (“steal”) you”. That is Divine Compassion (Karuna) and not stealing! !